Using a multicollector ion microprobe to study hydrogen-deuterium ratios in lunar rock and on Earth, a new study suggests that water on the Moon is leftover from when a giant collision sent a disc of debris from Earth to form the Moon, about 4.5 billion years ago. 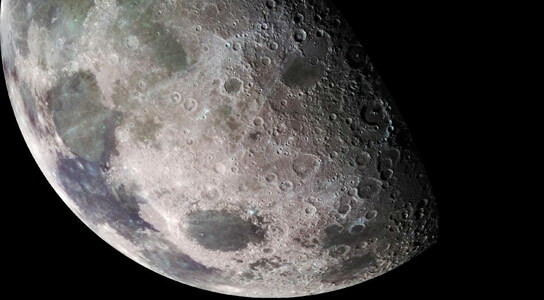 Providence, Rhode Island (Brown University) — Water inside the Moon’s mantle came from primitive meteorites, new research finds, the same source thought to have supplied most of the water on Earth. The findings raise new questions about the process that formed the Moon. The Moon is thought to have formed from a disc of debris left when a giant object hit the Earth 4.5 billion years ago, very early in Earth’s history. Scientists have long assumed that the heat from an impact of that size would cause hydrogen and other volatile elements to boil off into space, meaning the Moon must have started off completely dry. But recently, NASA spacecraft and new research on samples from the Apollo missions have shown that the Moon actually has water, both on its surface and beneath. By showing that water on the Moon and on Earth came from the same source, this new study offers yet more evidence that the Moon’s water has been there all along. To find the origin of the Moon’s water, Saal and his colleagues looked at melt inclusions found in samples brought back from the Apollo missions. Melt inclusions are tiny dots of volcanic glass trapped within crystals called olivine. The crystals prevent water escaping during an eruption and enable researchers to get an idea of what the inside of the Moon is like. Comets, like meteorites, are known to carry water and other volatiles, but most comets formed in the far reaches of the solar system in a formation called the Oort Cloud. Because they formed so far from the sun, they tend to have high deuterium/hydrogen ratios — much higher ratios than in the Moon’s interior, where the samples in this study came from. The finding is not necessarily inconsistent with the idea that the Moon was formed by a giant impact with the early Earth, but presents a problem. If the Moon is made from material that came from the Earth, it makes sense that the water in both would share a common source. However, there’s still the question of how that water was able to survive such a violent collision. It suggests, the researchers say, that there are some important processes we don’t yet understand about how planets and satellites are formed. Funding for the research came from NASA’s Cosmochemistry and LASER programs and the NASA Lunar Science Institute. 1 Comment on "Study Suggests Earth and Moon Have Common Water Source"
You could start with the idea that stars give birth to a naked singularity which remains in a feeding/nursery orbit close to its parent until it has enough matter to form an event horizon and become a protoplanet. Once large enough it should leave home forcing all its elder brothers and sister’s to also jump up an orbit. Once settled in the new orbit and while still a liquid creature it also could continue the birthing process or planetary meiosis and produce a satellite offspring of its own. Probably why many stars and planets are binary systems. They are mothers nursing their young. Possibly the reason Mars is barren is because it lost its surface life forms in the jump outwards as with the wind dispersal of pollen making ready for the next occupant of that abundant life orbit. Maybe the whole universe is alive. Like all living creatures galaxies apparently eat and can reproduce new blue stars supposedly after entering one another, the same fun method used by most other large life forms.